Back in 2012, social media giant Facebook purchased the young, but popular photo-sharing app Instagram for about $1 billion in cash and stock. It was a big move, and one that brought about a wave of changes in regard to the way that both Facebook and Instagram would work (and would soon work together). It also made it easier to share content from one platform to the other. What could go wrong? At first, nothing. But over time, the ability to cross-post content became so easy that it only required the touch of a button. Sounds great, right? Just open Instagram, edit your photo, write your captions with your chosen hashtags, and get ready to post on multiple platforms! Facebook? Sure! Twitter? You got it! Tumblr? Why not! So what’s the big deal? It may not seem like much to most people, but when your job requires you to be immersed in social media platforms of all types all the time – you notice things. 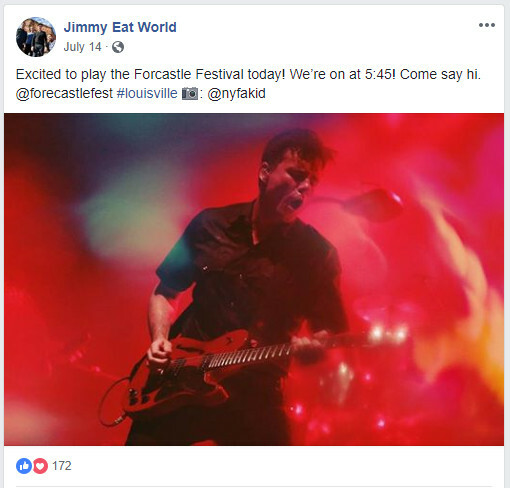 Here’s the best way for me to explain why you shouldn’t be cross-posting from Instagram to Facebook, with the help of a real-life post from one of my all-time favorite bands, Jimmy Eat World. 1) I can immediately tell that this was cross-posted because there are tags that are not actually clickable, and don’t lead to anywhere, to anyone’s Facebook profile, page, etc. The biggest issue with cross-posting a post AND tagging in it is that not everyone has the exact same social media handle across all platforms. So while @forecastlefest might be right for Instagram, their handle may be @forecastlefestival on Facebook, causing a disconnect in the tag. The same goes for the tagged photographer @nyfakid. Unless you’ve planned your social media handles to be exactly the same across all platforms (good luck finding them all available), then it’s really easy to miss out on opportunities to be tagged in posts like this, or others, that help promote your music festival, brand, company, or whatever. Mentions are a great way to get your post noticed, and possibly shared with a whole new audience (potentially gaining new interest in your product, whatever it may be, or even new followers)! 2) Hashtags. This example isn’t a bad one, with one hashtag, but I’ve seen some really bad ones. We’re talking an Instagram post with 20 hashtags shared directly onto Facebook. It just looks messy! And in the long run, that many hashtags on Facebook are not helping you out. 3) You’re missing the opportunity to add your location. This isn’t as important as the others, but it does help to let people know where you are, especially if they’re going to be coming to your business, venue, etc. Whether you’re posting photos from earlier that day, or at the moment, in most instances, you should be using the “check in” feature. Why check in? Because when a Facebook user clicks on that location, they’ll see all posts from pages and users who have checked in there. It’s a great way as a business or brand to get your post (and what you do) out there. To have this work correctly on both platforms, you’d have to add locations or check in on each post separately. But sharing to Facebook from Instagram is so much easier! You’re right! It is! If you’re absolutely strapped for time, and this is your only chance to post on Facebook, then by all means, it’s better than nothing. But ideally, you should be setting time aside (even if just a few minutes) to dedicate to each platform. Whether Instagram, Facebook, Twitter, or more – they all have unique features that make it difficult to get one “perfect post” out to all platforms at the same time. So why not do it right? Don’t have time to manage all of your social media profiles? Let us help. That’s what we do. Visit www.quadsimia.com/thrive/ and see how we can help your business thrive.